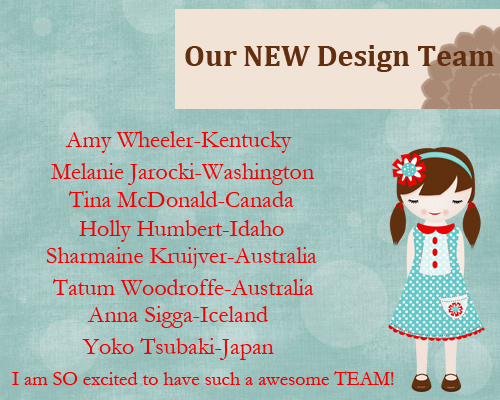 I'm so excited to finally announce that I'm part of the new Polka Dot Whimsy Design Team! I applied on a whim after drooling over the kits, and lo and behold, a dream came true! Funny Zoe story to share: Several weeks back, the kids were playing at daycare and the teacher's daughter got stung by a bee. Zoe cannot get rid of this vision of being stung by a bee. When we put her to sleep, and she wants to get up, she screams and cries, " The bee is getting me! ", among other things. I have to reassure her, there is no bee in her room and turn on all the lights to show her before she'll go back to bed. Hoping to do some baking tonight for FHE. 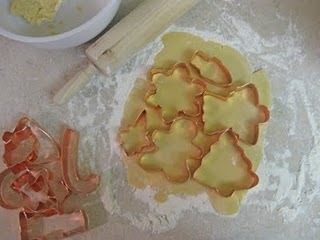 I've been craving sugar cutout cookies that my mom makes. I really just like the dough, but the cookies are good too. Although I think my cookie cutters may be packed up and sitting in my parents garage :( Maybe I can convince Ryan he wants to make the dough this afternoon, so it's all ready when we get home. Hope you're have a good Monday. I'll be sharing some cards this week and hopefully pictures of a new niece. Congratulations on the DT! Can't wait to see what you make! Good luck with your move, too. You are awesome BFF! You are going to kill it on this DT! So proud of you and your hard work! Keep it up...and keep scrapping pics of my kids....LOL! Ya!!! You totally deserve this!! congratulations! you will rock those kits. congrats on the DT...that's awesome!! Hi,Holly!Congrats on the PDW spot, can't wait to work with you!!! Congrats on the DT position! I hope you have a blast with PDW. congratulations, holly! I'm excited to be working with you on the DT :) And I'm right next door in WA! Congratulations Holly!! What fantastic news!